( First known descent - 5/20/2006 : Jon Fowlkes, Mike Long, Pete Giordano, Tom Cwiklinski, Jason Rackley. 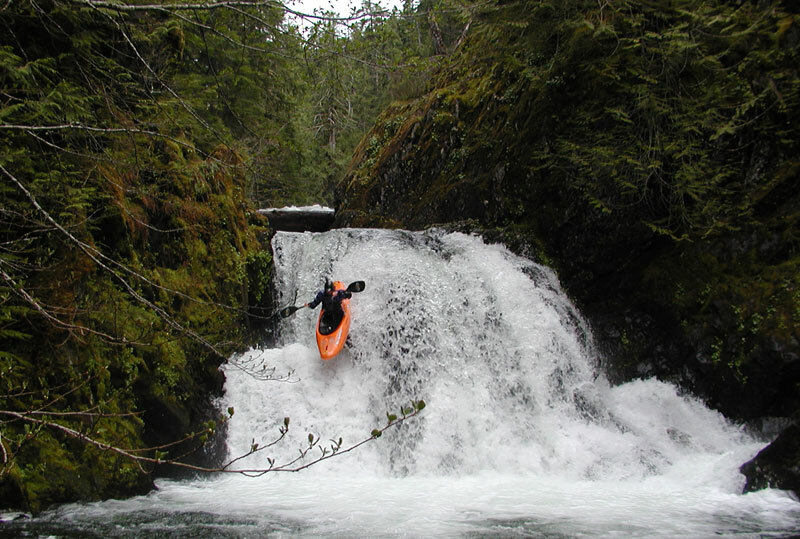 Note: The legendary and prolific exploratory kayaker Eric Brown out of Corvallis has the first known descent of Elk Lake Creek, probably sometime in the late 80's or early 90's. The story goes that Eric hiked in to avoid the long shuttle, from the bottom of the run.. That is a very, very long walk. Pete Giordano was the driving force behind this particular trip, which is often the case in our exploratory missions. Pete is one of the most tireless explorers around, spending many days in the fall off-season poring over maps, driving endless mountain roads, and hiking up countless dry creekbeds. 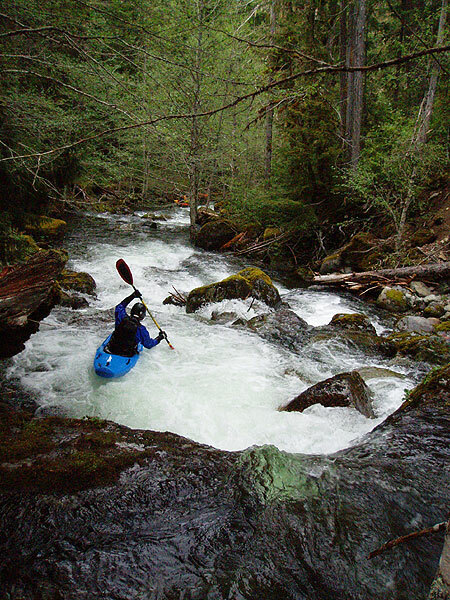 Pete also happens to be the primary author and editor of the most recent version of the Oregon paddling guidebook, so he is always the man with the plan when it comes to new stuff. 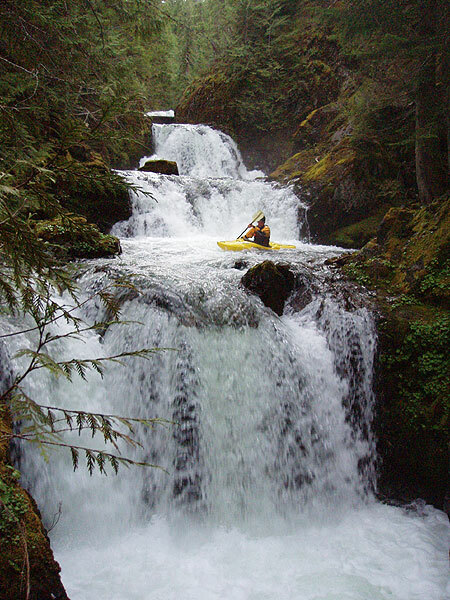 After running lower Elk Lake Creek gorge a few years ago, Pete and I wondered what lay upstream. However, several years went by before our attempt on the upper because of the daunting logistics. A 150-mile round-trip shuttle, high mountain roads usually blocked by snow, and no gauge were all factors contributing to the difficulty of this descent. Finally in the Spring of 2006 we decided to give er' a go. 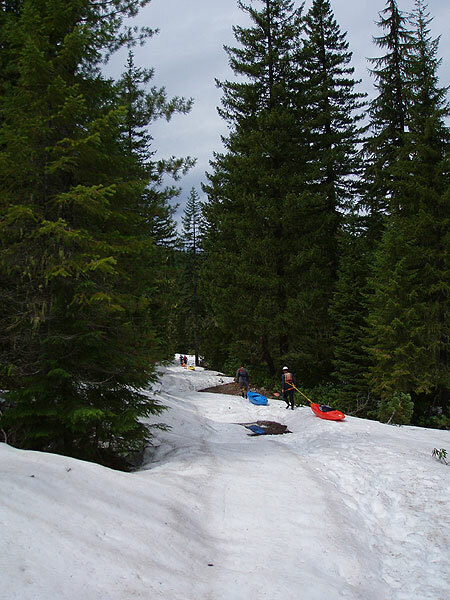 We were sitting on a near-record snowpack, and though we knew there would be snow on the road, we were also reasonably sure there would be water in the uppermost reaches of this little high-mountain creek. Mike Long, Jon Fowlkes, and Tom Cwiklinski joined Pete and I on this particular trip. On the morning of our attempt, we had a minor complication: finding Mike Long. 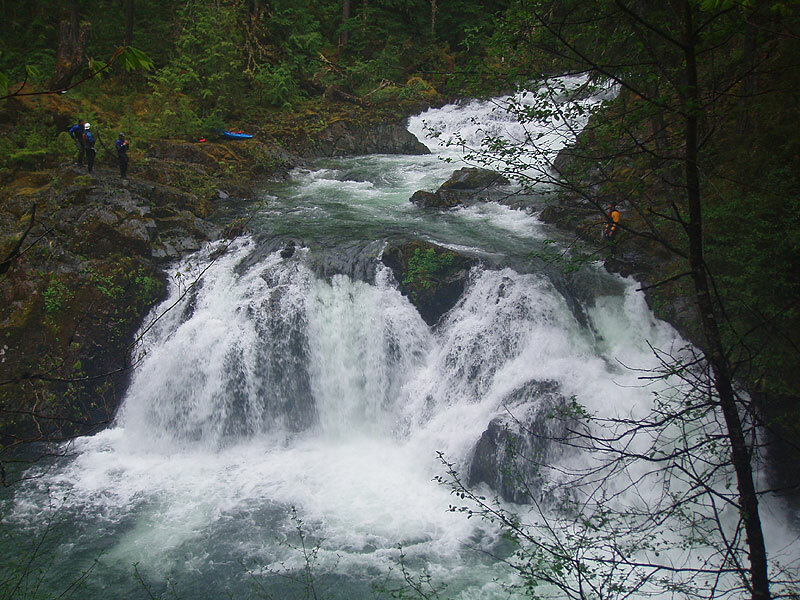 Mike was on the road with the PBR Whitewater Tour, and we finally tracked him down at the Clackamas Whitewater Festival. 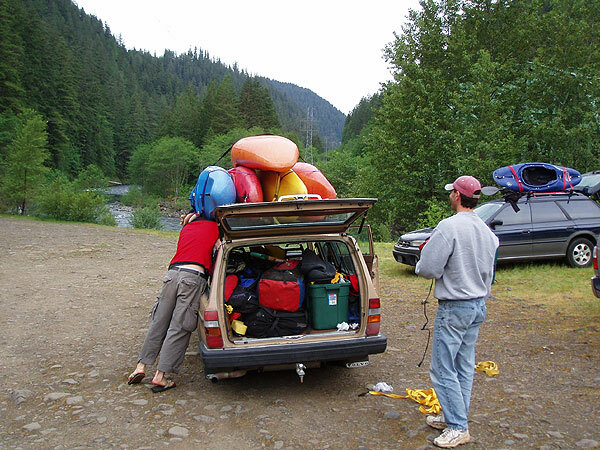 Mike was sleeping in his car after a late night, so we rousted him out of a deep sleep and got the gear loaded. Jon Fowlkes gets creative with the rack situation at Carter Bridge while Pete supervises..
We were now on the Clackamas side of the mountains, which is where the take out is located. 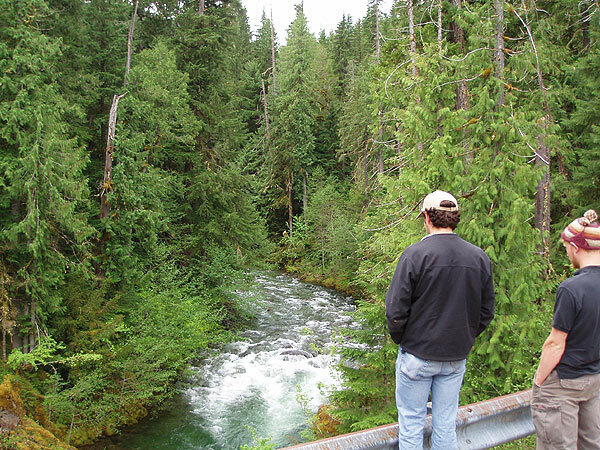 We drove up to the bridge over lower Elk Lake and checked the flows, which looked good. Of course, this bridge is located many miles downstream from the headwaters with several significant tributaries in between, so we ended up having about a third of this flow at the put in. Mike Long and Jon Fowlkes check the level at the take out. 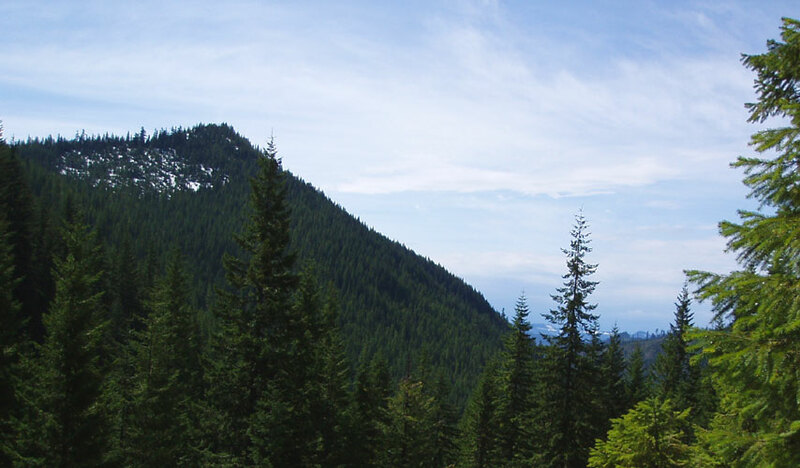 After dropping Pete's car at the bottom, we started the mega-shuttle, which involved a 75-mile trek to the other side of the mountains near the Breitenbush River, which is the only way to access the headwaters of Elk Lake Creek. We hit snow about a mile or so from where we had expected to start hiking down to the creek, so we got to start the day off with some bonus conditioning, AKA an extra mile of hiking through the snow. Looking down into the Elk Lake Creek drainage from the start of the hike. Luckily for us, the snow had begun it's melt-freeze cycle so it was hardpacked for the most part. This was key because it meant we stayed on top of the snow rather than post-holing. This made the approach hike much less punishing than other snow approaches we have attempted. Slogging up the road to Elk Lake. After about a mile we checked the GPS and decided we were close enough to where the creek exited from Elk Lake, so we took a right turn into the woods. Now the hiking became somewhat more difficult, and our pace slowed as our boats repeatedly fell into the deep holes at the base of the trees. We also got kind of spread out as we moved through the trees, which was not ideal. Jon and Mike stayed near a creek, while Pete, Tom and I gravitated towards higher ground which appeared to be more level. Hiking over the snow through the trees was a surreal experience, with fog rising off the snow and our voices cutting through the deep silences typically found in a snow-covered forest.. 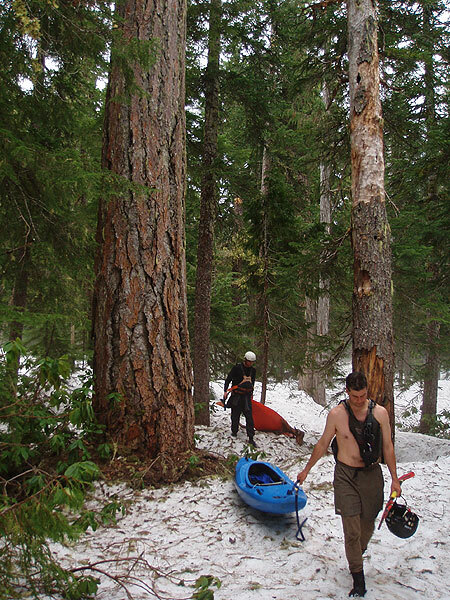 The pristine Elk Lake Creek drainage is jam-packed with huge old-growth trees like this one. We arrived at the creek and re-grouped. I was very pleased to see a narrow streambed composed entirely of bedrock as far as the eye could see. With geology like this, you can't go wrong. After a few short drops and some log limbos, we entered a significant gorge. The creek started flying around corners and we could hear a deep roar ahead. I was in front at this point, and after running a short slide I eddied out above a big horizon line. As everybody piled into the eddy behind me, I hopped out on the right and peeked over the edge. Jackpot! Below me was a perfect 20-footer, sloping nicely into what appeared to be a deep pool. I climbed back to the crew and said: "Clean twenty footer. Go right with the flow. I'm gonna go first so I can take pictures of you guys." Below Hammertongue the creek tilted on edge and started dropping. Pete was in the lead and we arrived at another horizon line. He hopped out and scouted while the rest of us clung to various rocks upstream. Finally he came back and said: "Go left, boof.." or something like that. I honestly don't remember him mentioning that there were actually two drops down there, but after Jon ran it blind I followed, boofed the heck out of what I thought was the drop, but no, the DROP was actually just downstream, and I fell into it like a sack of s--t, completely disappearing from sight and emerging downstream against the right wall, much to Jon's amusement, who was watching from an eddy downstream.. Another rapid named, thanks to my terrible line..
Tom gets his boof on at SOS. Pete and Tom converse in an eddy as we enter the steepest section of the creek. Soon we arrived at another big horizon line, with an island in the middle of the creek. 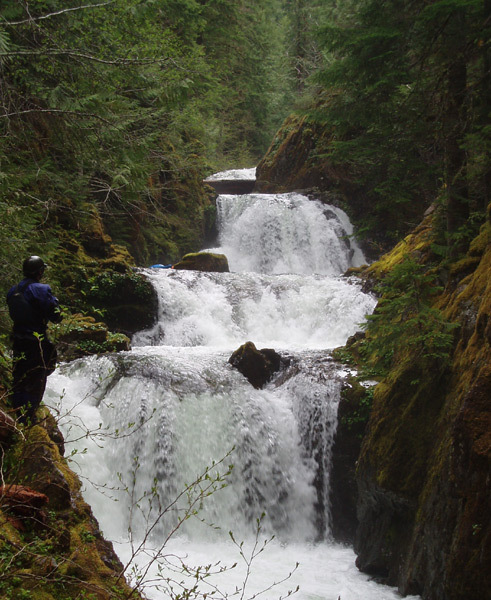 We got out to scout and found a log-choked waterfall, forcing a portage on the right. Downstream was another horizon line, so we just kept walking down the right side to scout. After a quick scout of the second drop we set safety and started running the sluice-drop. This one required some focus because the pool below it flushes into a log sieve, so we were extra-careful here. Pete was slightly off-line on this one and brutally pitoned into one of the fang rocks, coming to an abrupt stop and smacking his face on his deck. Another drop named..
Tom avoids the piton rock at Whiplash. Downstream the creek just kept rocking and rolling, with many runnable drops and a few log portages here and there. For the most part though the creek was very runnable and the portages easy. Tom runs a fun bit while Jon directs traffic below. Soon we arrived at a monster horizon line. 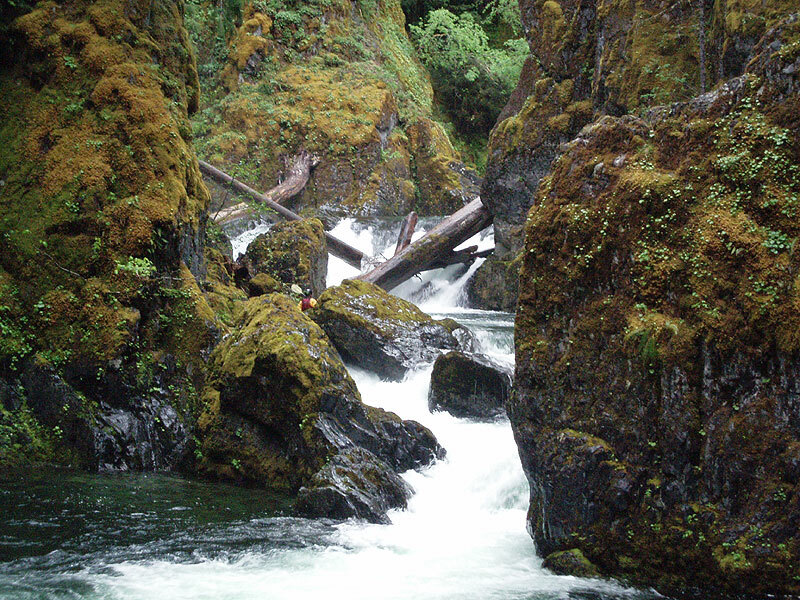 The creek rushed downstream into what appeared to be a bottomless gorge, so we got out on the left to scout. After a few fruitless attempts to see into the gorge on the left, we ferried across to the creek-right side and finally got a look at what the gorge contained: A beautiful 50-foot four-tiered waterfall, totally clean. The first drop was complicated slightly by a low-hanging log, so everyone portaged this one on the right except Mike Long, who felt confident that he could hit the line. Portaging the first falls in the series required some minor trickery, because the gorge walls are nearly vertical and over a hundred feet tall, so we had to stay near creek-level. It should be noted that the final two drops in this gorge should be considered mandatory, because portaging either of them is not a practical undertaking due to the scale and steepness of the gorge walls. For this reason and the overall high level of commitment associated with these falls, Pete later named the series 'The Little Demon'.. Looking down into the entrance of Little Demon. Jon gets the 'thumbs-up' from Mike Long, who is barely visible downstream on the creek-right cliff wall. Pete went first, firing off the second falls in the series without problems. Mike was up next, bombing smoothly down the whole gorge with a whoop at the bottom..
Mike Long runs the second part of the Little Demon. The first falls that only Mike ran is barely visible upstream, as well as the low-hanging log that had the rest of us portaging. 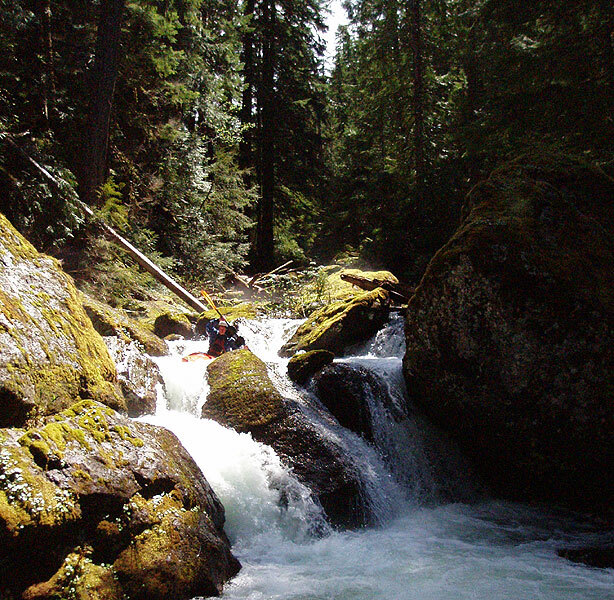 Mike Long contemplates the Little Demon Gorge after his first known top-to-bottom descent. 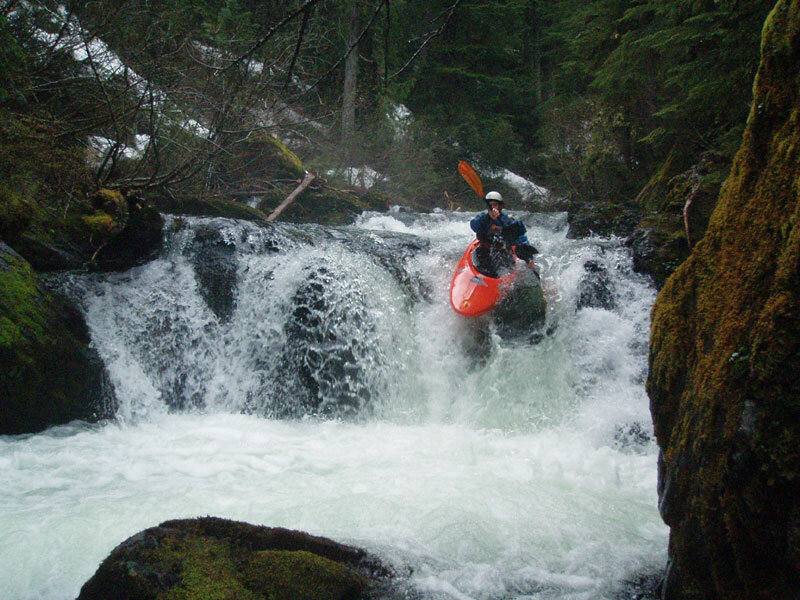 Jon Fowlkes in the Little Demon Gorge. Below the Little Demon the quality geology continued, with a series of runnable falls and ledges that were super fun, including sweet fifteen-footer that I did not photograph. 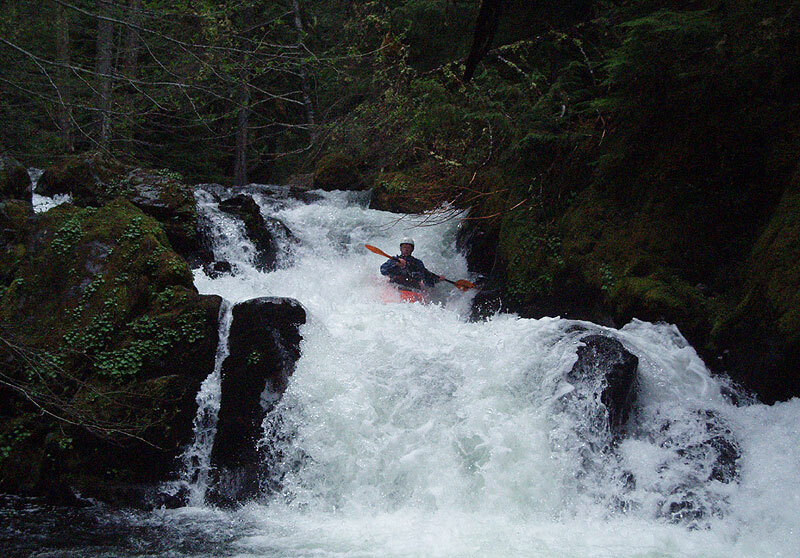 Tom runs a cascading drop just downstream of Little Demon. Below the fifteen footer ( no photo ) the geology lost quality, degrading into random boulder gardens. This slowed our progress somewhat, because the piles of boulders required more careful scouting for wood hidden in the blind slots..
Pete runs a typical boulder garden downstream of the bedrock sections. 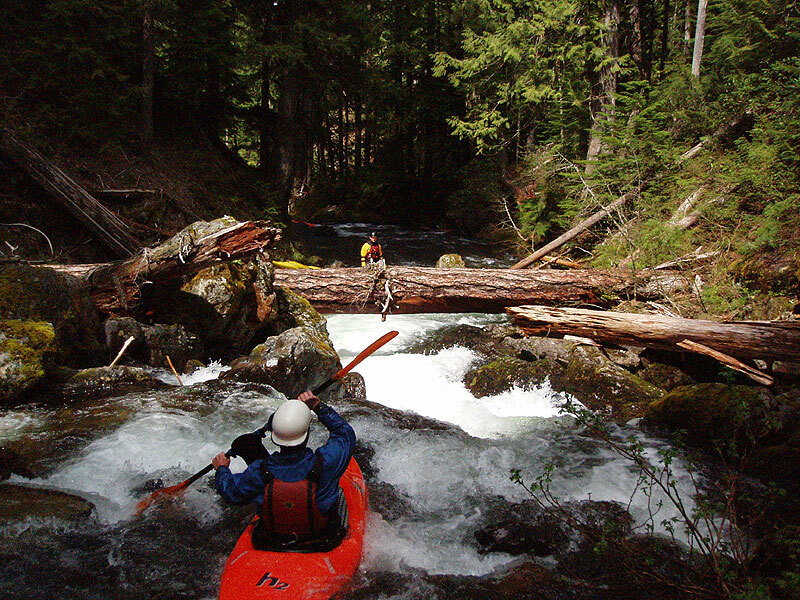 Below the final few boulder-strewn pitches, we reached the confluence of Battle Creek, which nearly doubled the flow. Below Battle Creek the streambed flattened abruptly and assumed a class three nature, with some excellent quality bedrock rapids separated by looong sections of class two. We had already been paddling and hiking for several hours at this point, so we moved downstream with a sense of urgency as the sun dropped into late afternoon. After an hour or more of mellow stuff, we arrived at the familiar lower Elk Lake Creek gorge, which has several documented descents ( the earliest known by Dan Coyle, Gabe Flock, etc, back in the nineties, but there were undoubtably others before that ). It had now started raining and there was an element of fatigue after our long day, but we were near the end of the creek with only a few drops between us at the bridge. Mike Long went first, firing off the entrance falls down the meaty left side, then caught an eddy and ran the left-side line of the twenty footer, which is mucho sketchy because the water pours into the wall. Mike hit the wall but didn't seem to mind.. The crew relaxes between drops in the final gorge. Everyone ran the main center line on the twenty-er except mike, who aced the mucho sketchy creek-left boof..
Below the twenty-er is a steep boulder garden, following by the Whale-tail ledge and then the end of the line, a beautiful fifteen foot falls that is insanely choked with logs. This falls had forced brutal portages in the past, but the floods of '06 rearranged the wood slightly, allowing it to be run with success down the creek-right side.. Mike and Jon led the way here, firing off the right side of this nightmarish-looking drop with no problems..
Jon Fowkles looks up at the log-choked exit falls in the final gorge. 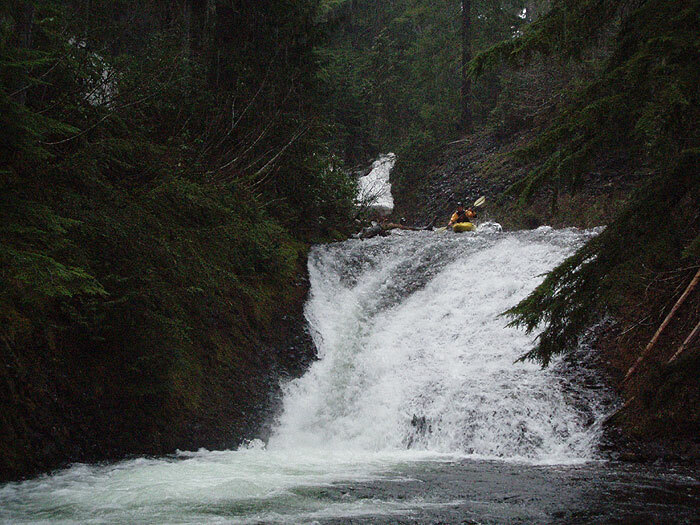 Since the flood of 2006 this drop is now runnable down the far right side, eliminating the need for the brutal creek-left portage. Below the final drop in the gorge the creek opened up and we enjoyed mellow cruising to the take out bridge. We were all definitely feeling a little fatigued at this point, but also quite pleased with the quality of the uppermost reaches of this creek. 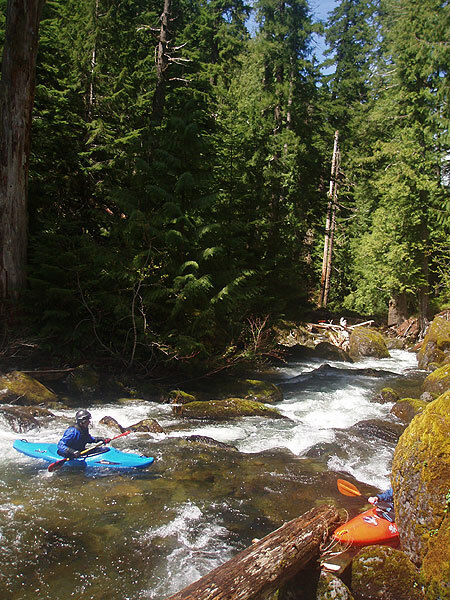 Definitely a creek worth paddling. 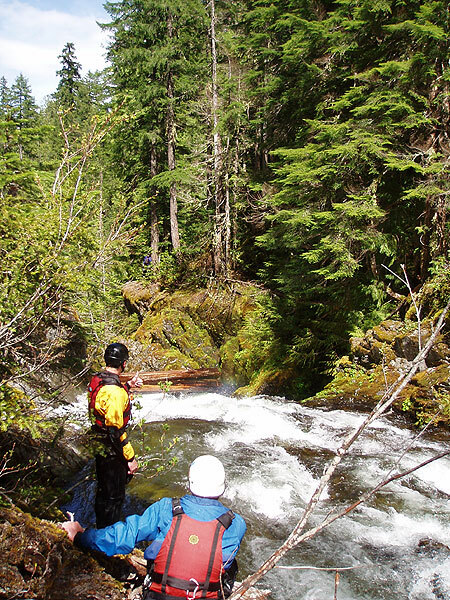 This is a beautiful mountain steep creek that is well worth doing. The approach is somewhat difficult but not too bad. There are a fair number of log portages on the upper section because this creek is fed by a lake which acts as a buffer and prevents the creek from flooding properly. Flows can be checked at the take out bridge, expect about a third of what you see at the bridge on the upper sections. We definitely could have used 50-100% more water in the creek. 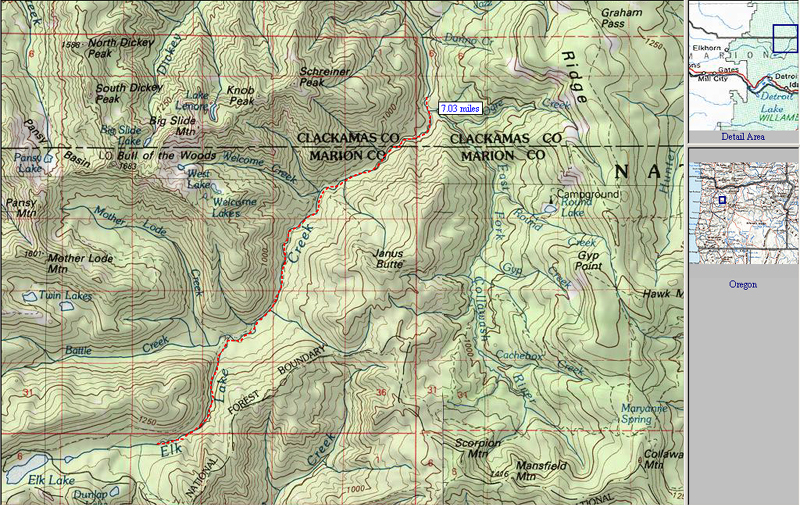 This is the section we ran highlighted in red, which includes the lower gorge which has seen several other documented descents. The middle section between the two gorges is flat and uneventful, and honestly felt like a long slog to us after the action-packed upper section..